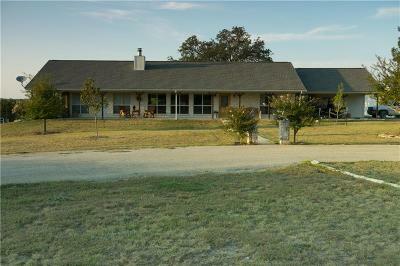 BEAUTIFUL Austin stone home on 178 wooded acres with hills, valleys, a creek, two ponds, and a meadow! Has a wildlife management exemption & supports deer, turkey, doves, & hogs. Home is in excellent condition with large family room with two way stone WBFP and a spacious master suite with walk in closet, and covered screened in porch to the side! Home features granite countertops, tile backsplash, beautifully stained & scored concrete floors, built ins in the master, living & dining rooms, & covered back porch! Kitchen features ceramic cooktop, vertical storage racks, pull out spice racks, & glass fronted cabinets. Has a small attached workshop & a 40 x 40 barn! Includes fenced garden. Equipment negotiable.